Today weighting systems for trucks are very popular at different spheres including manufactures, mining and agraric. RFID helps to improve a lot of business processes here in part of scale automation and take off corruption factor of security. A lot of processes become easer in clue of electronic documents. Grain elevators, vegetable storage stocks, cereal storage. Minings: sand, gravel or diamonds with its high level of security. By using RFID with weighting system your company can get very accurate statistics, also with minimum influence of human factor without any chance for corruption of security employee. With using taken values of cargo you have an ability to have accurate calculation of coeffecients of business process and employees effectivity. When RFID integrated to IT-systems of your company you can get an information about timing of trips by car and by employees. 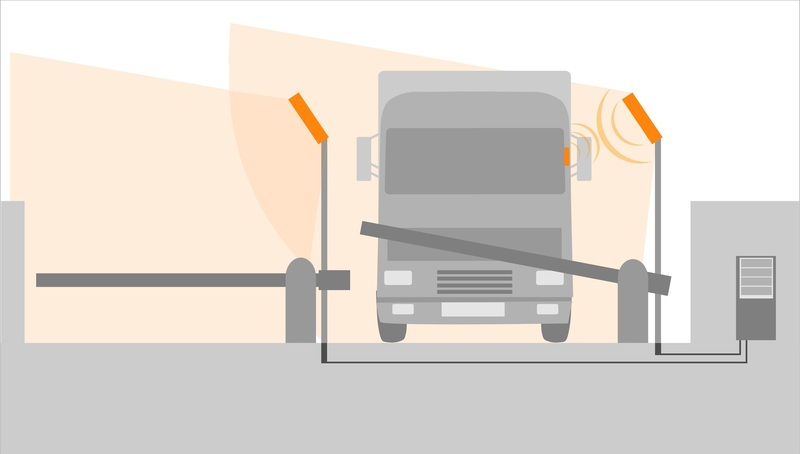 To have weight of a truck you can use any king of digital weighting system what you already have at your manufacture - we will connect RFID to its. It helps to safe money and other resources. We provide RFID to IT system, add to this information weight if truck and cargo. In the basis of RFID technologies, we use RFID-tag as main identificator of truck or tracktor. This is very small electronic device which has a unique number, as an addition we can provice cryptography to its to increase security status. As a rool, we use different types of RFID tags, which are comfortable exactly to concrete technological process. The most spread tags are - RFID labels for windshield of truck, RFID cards for employee, RFID tag for tractors. Windshield tag is one-used, when you try to remove it from car it become broken - then will never work. So windshield can never be taken by another person. RFID tag "hard tag" case very robust plastic case - car could be equipped by its outside. This method is good for very long range reading applications. It could be mounted by screws, by glue or by wielding. RFID plastic card looks like simple bank card - it is good for personal driver identification. All our systems have security to avoid RFID tag cloning or electronic grabbing. So we can help to improve a security status of your manufacture. When RFID-tag appears in field from RFID-antenna, reader take an information from RFID-tag. As a rool it is a unique number which was programmed by ISBC or by somebody from your company (The memory should be locked from reading or rewriting). Reading process - is automatic process. By the settings of system we can tune the distance from 0.5 m up to 20 meters (it could be more, please be in contact with ISBC technical support to get an information). Also we can determine truck with RFID tag in concrete place - exactly on weighting platform. We have a lot of possibilities to integrate RFID from ISBC to your company IT-infrostructure. Including software ability or hardware ability. RFID tags which we use are passive, that means that they don't have any kind of battery inside - they work with help of RFID-field from RFID-antenna. An electronic chip is being activated from RFID field of RFID antenna - the power is even anough to get a response with unique RFID number of tag. Energy from RFID reader and antenna is safety for human. The field is very small and we can compare it with field energy from simple mobile phone. ISBC make technical support for free. We are glad to have you in a count of ISBC's clients! If you have any questions about RFID as its and also about concrete types of RFID devices, please be in contact with technical support service of "ISBC RIFD". Also we can provide everything for another types of vehicle, including everything to make contactless access for control post. Please find bellow some photos with different samples if RFID using at real farm. We a glad to work with you.